With the growing interest in traditional and complementary systems of medicine across the globe, a facility that helps authenticate the identity of medicinal plants, especially in the form of a repository of the natural resources used by the Indian systems of medicine, would be a great help to conservation fraternity as well as the academicians, botanists/herbalists and research workers. The quality control for herbal drugs assumes great importance and it must start with the procurement of authenticated raw material. The first and foremost requirement is the botanical/ herbal drugs of standard quality. Correct identification of botanical drugs would need reference standards. Therefore, a Repository of such herbal drugs with an excellent herbarium having authentic voucher specimen is the need of the hour. 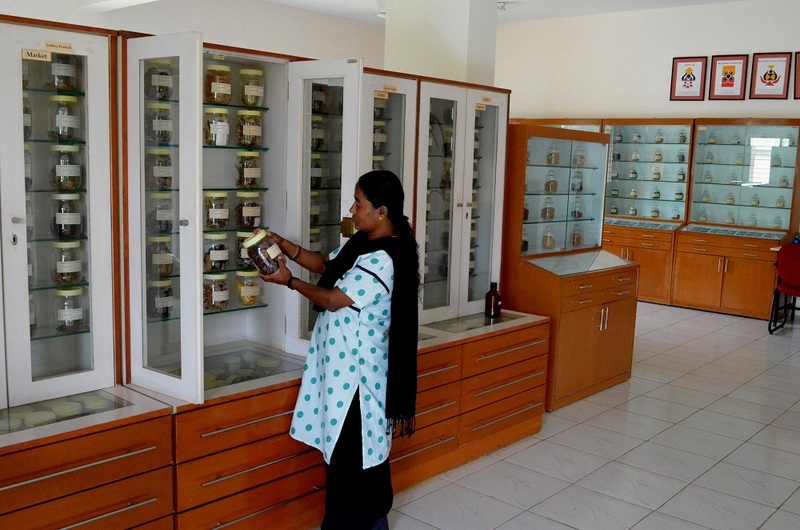 This state of the art ‘FRLHT-TDU Herbarium and Raw drug Repository’ houses these natural resources used in the Indian System of Medicine, in the form of herbarium and raw drug samples. The botanical drugs comprising, root, stem, leaves , flower, fruit, seed, root & rhizome, stem & leaves, fruit & seed, stem bark, root bark, heart wood, whole plant, whole plant without root, exudates, gum/resin, tuber and bulb, have been classified on the most scientific and modern lines. This enhances its significance multi-folds as a conservation research facility.